San Diego County was inundated overnight Tuesday with heavy downpours and inches of snow at higher elevations while another, much smaller bout of rain was possible Tuesday evening. Downpours began late Monday and, by 4 a.m. Tuesday, had dumped about a quarter-inch of rain on most areas of San Diego County excluding the deserts, according to the National Weather Service's 24-hour rainfall totals. Four hours later, average totals had increased by up to about a quarter-inch. By that time, NWS reported that the coast had received less than three-quarters-of-an-inch of rain while the mountains and valleys received nearly a half-inch of rain. As rain poured overnight, several minor crashes were reported on freeways across the county, NBC 7 weather anchor Whitney Southwick reported. Before 5 a.m., at least two spinout crashes were reported. Meanwhile, San Diego mountains reported receiving snowfall overnight prompting the NWS to issue a winter storm warning through noon Tuesday. A winter storm warning is issued when heavy snowfall creates difficult to impossible driving conditions, the NWS said. Those traveling in the mountains should prepare their vehicles for an emergency. In total, the storm could bring anywhere from 6 to 16 inches of snow to elevations between 5,500 and 6,500 feet. 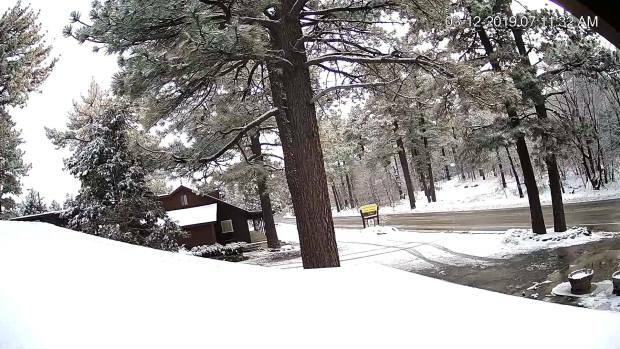 By 8 a.m., the Laguna Mountain Lodge resort along Sunrise Highway, with an elevation of approximately 6,000 feet, reported the mountain was experiencing temperatures of 38 degrees and had received one to two inches of snow so far. The NWS reported that Palomar Mountain's Birch Hill recorded three inches of snow during the same time period. San Diego's mountains were also experiencing gusty winds. A wind advisory was set to take effect at 6 p.m. Tuesday -- when the heaviest winds were expected to occur -- and would last until 6 a.m. Wednesday. During this time, winds would average 25 to 35 miles per hour with some gusts reaching 65 mph. 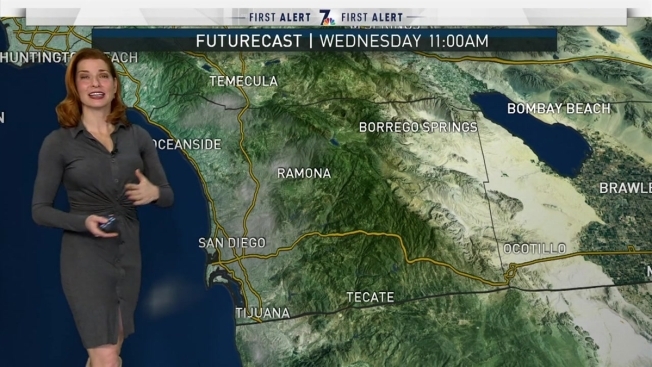 Some sprinkles could trail throughout the day, according to NBC 7 Meteorologist Sheena Parveen, but more likely the day would be sunny with some lingering clouds. Downpours may return overnight, though, once those showers make their way out of the region, San Diego can expect to see clear skies and sunny temperatures for the rest of the week.